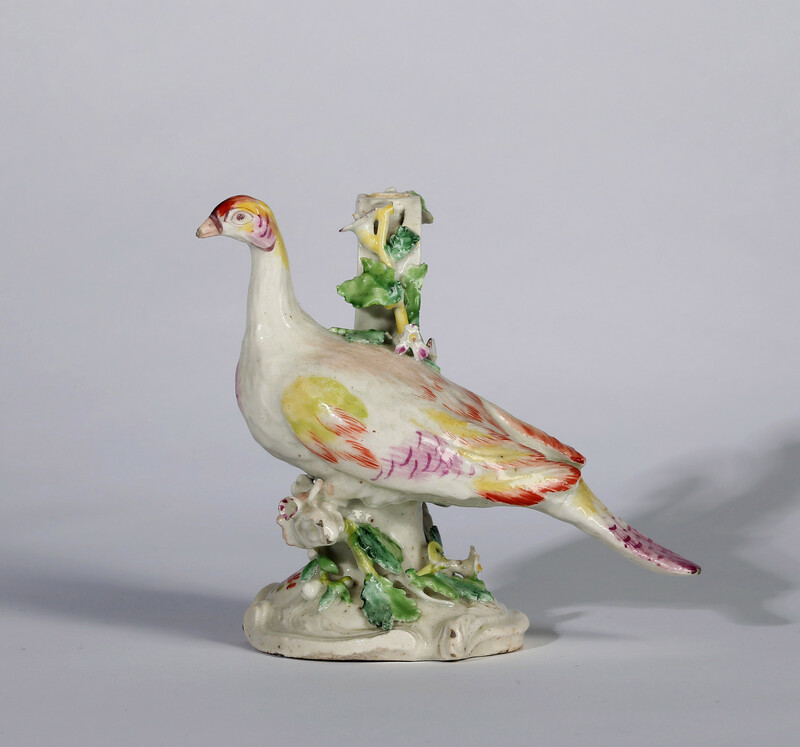 Modelled as a bird, perhaps a pheasant, perched on a branch and supported on a spreading base with rococo scroll edge, the backed by an ‘S’-shaped support for a candle sconce with applied leaves and flowers. Enamelled in a bright palette of green, yellow, puce, iron red with touches of brown on a glaze which pools with uniform bubbles and some faint craquelure over a slightly granular paste. This belongs to a rare group of figures that is sometimes called The ‘Girl-on-a-Horse’ group after an ambitious figure in a private collection illustrated in ‘Derby Porcelain, The Golden Years 1750-70’, Dennis G. Rice, 1983, Col. Pl. A. There are about fourteen examples of this class recorded, consisting of nine different models. Only four of these known pieces have the distinctive incised mark. 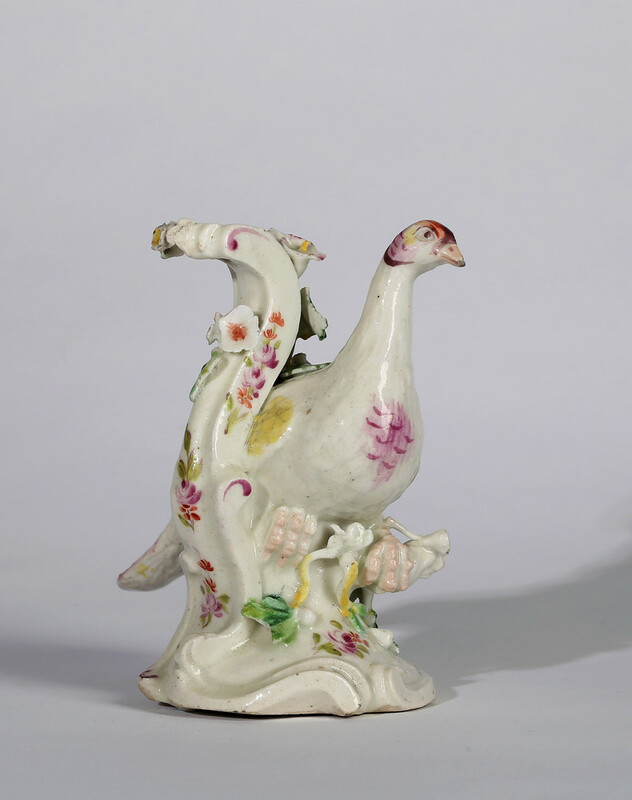 In ‘English Porcelain Figures of the 18th Century’ (1961), Arthur Lane suggested that these figures might belong to a transitional group of Derby porcelain made around 1755 just after the Planché period. 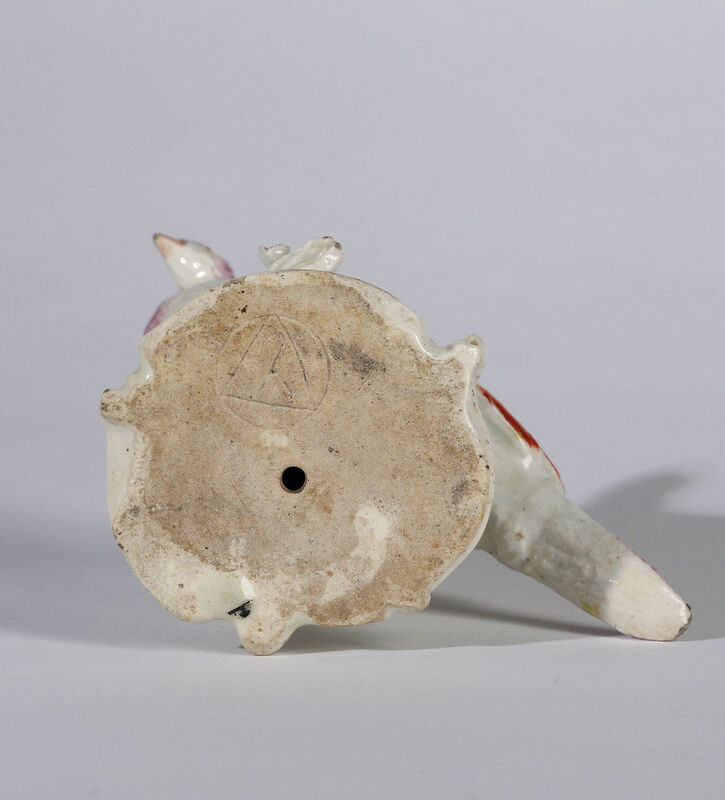 Lane also included certain figures of Chinese children and a Chinaman as a watch stand in this group and suggested that experiments might have been made with a new paste to facilitate more complicated modelling. Dennis Rice, and more recently John Mallet in ‘Early Derby Porcelain and some Disputed Attributions’ in the Derby Porcelain International Society journal, II, 1991, pp 16-18, have pointed out that none of these models exist in either the preceding Planché period or in the following ‘Pale Family’ group as the paste and palette is so different that they were more likely made at another unidentified factory. 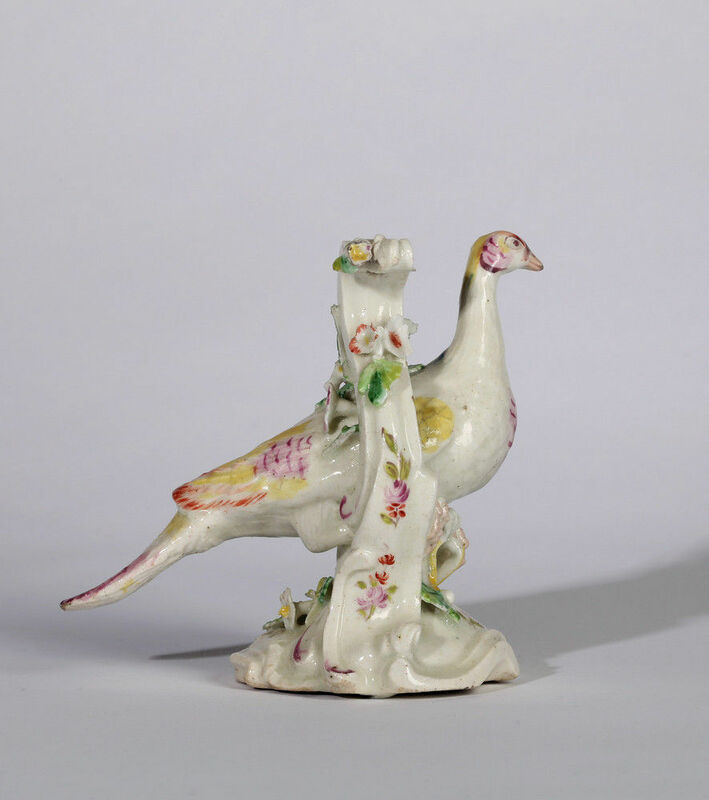 As these figures have more in common with the production of the Midlands factories such as Derby and Longton Hall and have little in common with the London factories John Mallet has speculated on the possibility of them being made at the mysterious Birmingham Porcelain factory. Virtually nothing is known of Birmingham porcelain but an advertisement in The Public Advertiser for May 1757 asserts that the stock of the London dealer, Thomas Williams, contained ‘…an assortment of all the Porcelain Manufactories in England, of any account, the largest Variety of the Derby or Second Dresden, with Chelsea, Worcester, Bow, Langton Hall (sic), Birmingham, &c.’ John Mallet also suggest attributing a rare class of sauceboats and jugs to this group. Our figure appears to be the only marked example of this class of porcelain to have appeared on the market in living memory. Condition – Minor chips to tip of beak and tail. Chips to flowers and leaves. Sconce lacking.